all summer long we got tons of blueberries from the farm through our CSA. i made muffins, biscuits, smoothies, and this cake with them, yet i still had excess blueberries! so i froze them for a rainy day aka the hell that is No Fresh Produce for Two Months (georgia’s short winter). blueberries are super easy to freeze – just spread them on a tray with parchment paper, and once they’re fully frozen corral them into a bag. or i like to save the little plastic clamshells berries and tomatoes from the store come in, and reuse them for holding frozen fruit. this blueberry skillet cake is a great use for frozen blueberries! 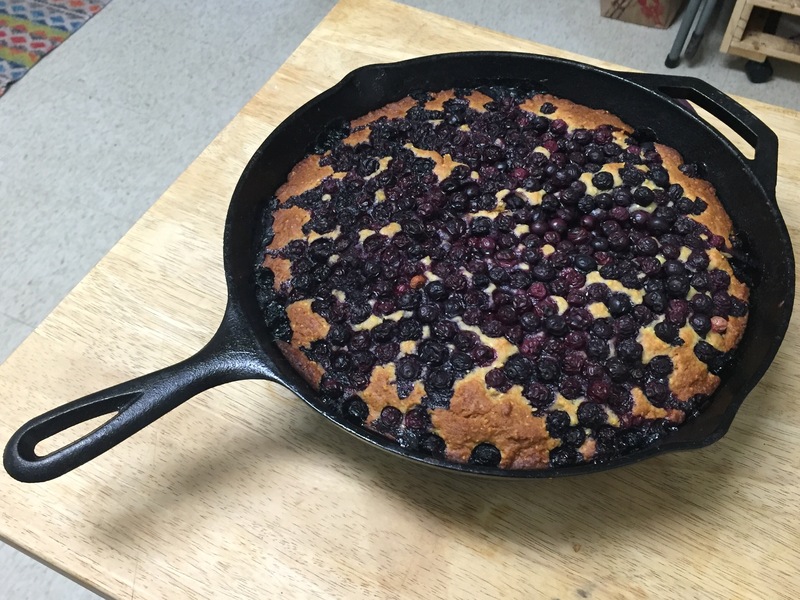 i came across this recipe for blueberry cornmeal skillet cake from quinn veon of reformation acres‘s book cake stand via one of my favorite blogs grow forage cook ferment. now, i’m not much of a baker outside of bread and i don’t have much of a sweet tooth. baking makes a mess. and i generally don’t have the patience required to measure everything out and do all the steps in perfect order. that’s why this is the perfect recipe for me – it’s simple, easy, only dirties two bowls, and makes use of things i already have laying around. to make this baking project healthier, i usually use whole wheat pastry flour and leave out the some of the white sugar, adding some extra raw honey to compensate. i also use greek yogurt for a big protein boost. you can whip this up in 15 minutes and clean up in 5. added bonus – the cake is freaking beautiful! and cooking in a cast iron feels badass. batter made with 2 cups of farm fresh blueberries dumped on top.